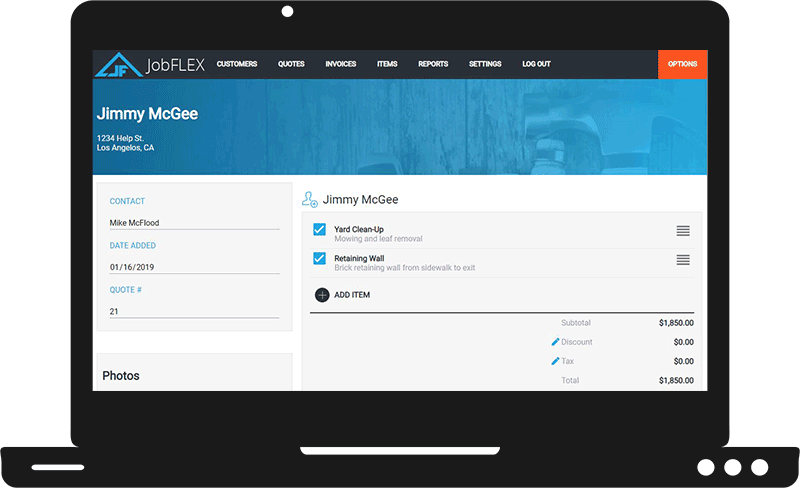 JobFLEX’s Android App has been massively popular since its inception, but one persistent thing we’ve heard from contractors is “When will there be a web version?” The time has come. Now you have all the powerful features of JobFLEX’s mobile app available to you on your desktop or laptop. Oh, did we mention that on top of the features you’ve come to know and love, there are also some new additions to JobFLEX’s already potent abilities as an invoice maker and estimate creation tool. Export Reports. When you run a report on the website, you can download the report using a link at the bottom of the page. With more screen real estate, we’ve been able to add more details into the reports available on the web version. If you download the report you’ll find that several of them include significantly more detail. Import/Export Items List. One of the most powerful features of JobFLEX is the ability to add and edit your items list (you can even start from our pre-built lists here). The beauty of this feature is how easy it is to edit. Just download an export of your current items list, modify it in Excel or create a list of new items to import. When importing you can choose to add to, or replace your existing items list. Marketing Source. Trying to assess which of your marketing channels are effective can be a tall task. Fortunately, with this new rollout, JobFLEX allows you to track which campaigns are driving more leads and more business. Now, when you create a quote you can assign the marketing source and you can run a report at any time to view the quoted and sold percentages of each source via the new Market Source Report. Google Calendar Sync. Integrating with Google Calendar will allow you to better organize and schedule your team’s activities. When viewing customer details, you can schedule a new quote which allows you to assign a salesperson and set the date the salesperson should meet with the customer to complete a quote. This will create a quote in JobFLEX and schedule the date for it. By selecting Google Calendar sync, the appointment will be synced on the designated sales person’s Google Calendar on their phone so they can just click on the appointment from their calendar and receive directions to the job location. If the job site location is different from the customer address, make sure to fill it out and then set the appointment again to update the Google Calendar Entry. Time to update to the market’s leading invoice maker and estimating tool? Try a free trial of JobFLEX today and see for yourself just how much the right tools can impact your business.